When I was little and camping with my family, pitching a tent looked like a magical feat completed by the adults in the group. One minute there was a clear open space and a few minutes later we had a hangout and a safe place to rest. Pitching a tent isn't magic, but it does take some skill, planning, and a wee bit of practice to get it perfect. Lucky for us, tents come with instructions and most tents these days are straightforward and easy to pitch. Pop-up tents set themselves up, although they're not big enough for families. 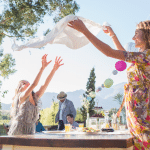 With some prep work and planning, you'll be pitching a tent on your site and wowing children of all ages in no time. 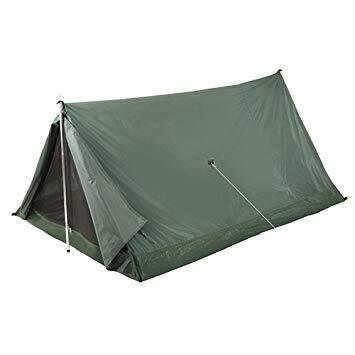 If you break down pitching a tent into the simplest terms, you have a designed piece of fabric held up and out by aluminum poles and staked down with pegs. Your tent can be a simple A-shaped structure or a complicated multi-room geodome, depending on your needs. The tent you choose can be heavy or light, but no matter which tent you choose, the basics are the same: fabric, poles, stakes. Before you can get busy pitching a tent, you have to decide on a tent design. 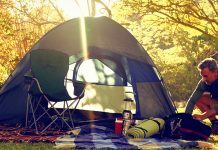 There are several kinds of tents, but there are some common tent shapes you're probably familiar with by seeing them on outdoor shows or from camping yourself. 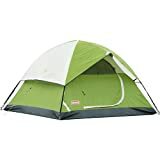 Different kinds of tents are for different purposes. You'll need to pick a tent to match your purpose and how many people will sleep in it. The materials used to make these tents are equally as important as the shape and size of the tent itself. Different materials will have different weights, and some are better in certain weather conditions. For instance, if you're hiking on the side of a mountain and you're carrying your tent with you, you should bring a tent made of lightweight but sturdy fabric. You're not going to be able to lug around a heavy and bulky canvas tent on your back as you scale a mountain. Similarly, say you have a family of eight camping in the woods in fair weather. Nothing too extreme. You could choose a cabin tent or a multi-room tent made from heavier fabric. Here are two familiar tent shapes and two different tent making materials broken-down for you. One of the most common shaped tents is the dome tent. Its shape is, of course, a dome. 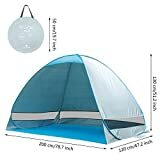 The tent is not only inexpensive, but dome tents are also easy to pitch. They're meant to house four people comfortably but aren't meant to withstand high winds or bad weather. 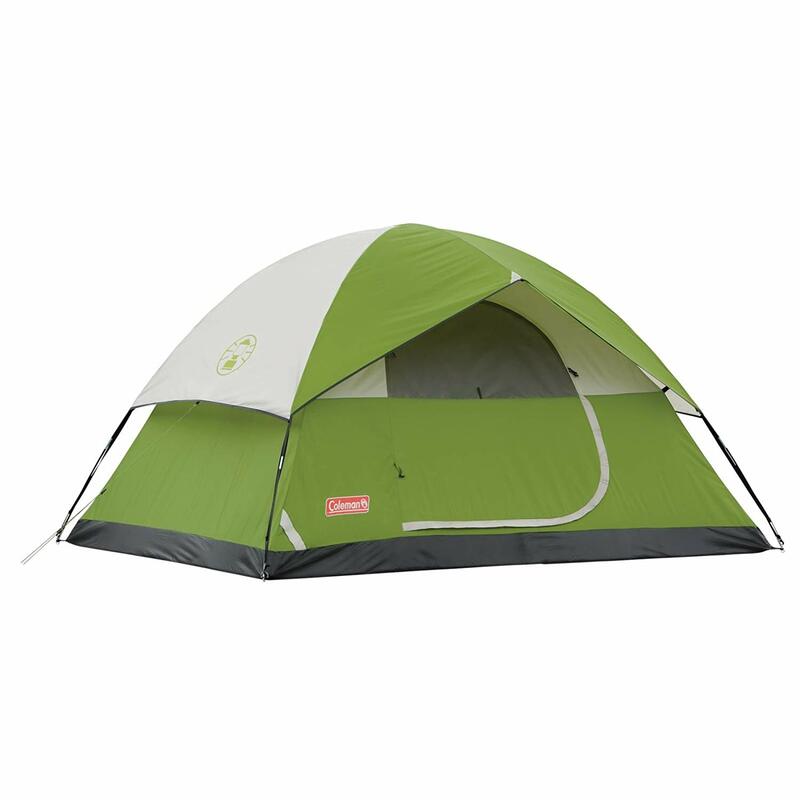 This tent is popular among families going camping because of the size, price, and ease. Most families aren't going to camp in extreme weather, on purpose anyway, which is good because of that not a dome tent's selling point. People choose the dome tent also because it has headroom. The whole family can hang out inside the tent after dark and play cards or hide from bugs midday and have a snack. The tent is lightweight and doesn't take up much room in the car when packed down, making it an excellent choice for family travel. The set up for dome tents is straightforward with two flexible aluminum poles that crisscross at the top. The poles bend down on all four sides and attached to the outside floor of the dome. This tent goes up fast. 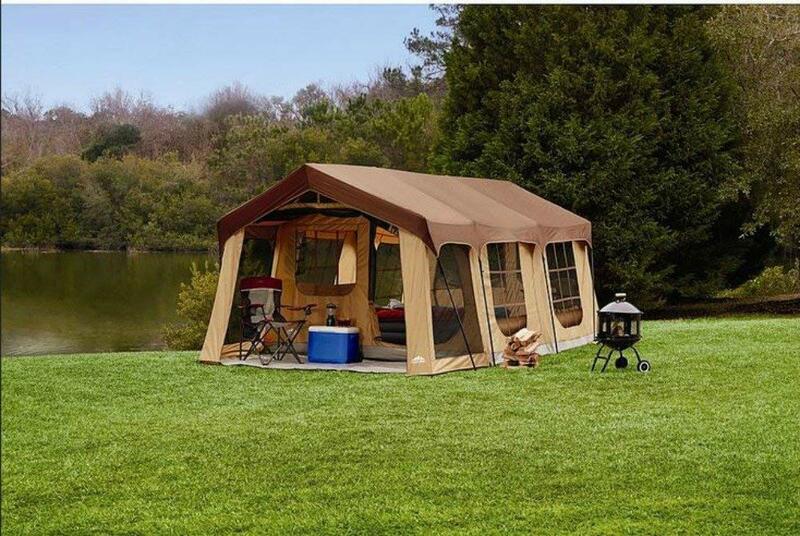 Most dome tents come with a porch in the design. An extra pole is included in the pack with material to build and secure a porch right onto your tent. A porch addition gives you the opportunity to hang out on the outside of your tent, but still have protection from the midday sun or light summer rain. Another solid choice for your family's camping sleep quarters is the cabin tent. Cabin tents have an aluminum framework like the dome tent. Instead of creating a dome, the aluminum poles piece together to form the shape of a cabin. Internal dividers inside the cabin tent make it a great choice for larger families. They're still inexpensive and, like the dome, not built for bad weather. You can choose a tent made with polyester, nylon or canvas, depending on your preference. The sheer size of these tents makes them heavy no matter which material you choose. 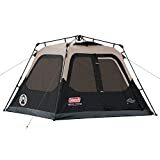 On the other hand, there's a lot of room, so if having lots of room is your goal and you don't mind the weight, cabin tents are a good choice. When you set up a dome tent, as mentioned, you have two main poles that crisscross at the top to make the frame. That's simple. With a cabin tent, you're building the framework for a cabin. You're creating a make-shift house in the woods. The aluminum poles and the way they fit together to build the cabin framework the fabric drapes over can be complicated. Don't expect cabin tents to last more than a season or two, especially if you do quite a bit of camping. The reason they're a reasonable price is that they're cheaply made to keep the cost down. So, while they provide a lot of room for your family and protection from the elements in fair weather, expect to replace your cabin tent often. Tents can be any material, but cotton, nylon, canvas, and polyester are the most common. You may be familiar with nylon because that's the fabric used for pantyhose. The reason some makers create nylon tents is that the material is so lightweight. Nylon's usually used for small tents and is an excellent choice for backpacking tents. The individual nylon fibers are resistant to water, so the fabric is lighter than other materials. If you've ever had pantyhose you know they can run pretty quickly. 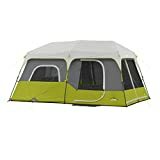 Why in the world would you want a tent that could run straight up the side with the flip of a fingernail? The answer is that manufacturers coat the nylon with either acrylic, polyurethane or silicone for tents, preventing this travesty. As with all things, the better the coating quality, the pricier the tent. Also, when making nylon tents, manufacturers add what's called a rip-stop. A rip-stop is a fabric weave that will stop a run from ruining your tent. So, if something pokes a hole in your brand new nylon tent, that doesn't necessarily mean you've ruined the tent. On the downside, UV light weakens nylon, so it also needs a coating with a light filter protecting it from the sun. Without that, your tent will have a shorter lifespan. The most significant disadvantage to a nylon tent is the synthetic fabric isn't breathable. 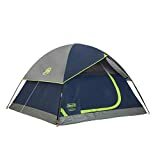 Because the fabric can't breathe, the tent will be whatever temperature it is outside, and condensation will collect on the inside of the tent. 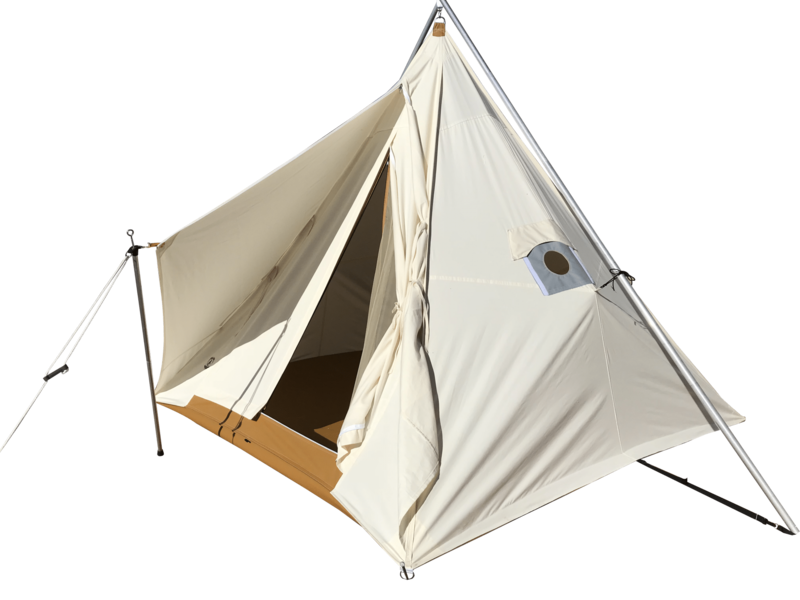 An older choice and one that isn't as common anymore are cotton canvas tents. Canvas tents are heavier than their man-made counterparts, which make them a less popular option. Aside from their weight, canvas tents can leak, which presents an obvious problem for the people sleeping inside. The leak problem can be easily solved, though, by weathering the tent. Weathering is simple to do and only involves setting up your tent a few times before a rainstorm. During the rain, the cotton fabric will soak up the water and swell. The swelling closes up the gaps in the weave, creating a leak-proof tent that will keep you warm in the winter and cool in the summer. It may take a few times of weathering to shrink every gap, but the effort is worth it. 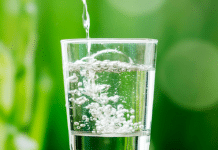 Unlike synthetic fibers, cotton breathes. You don't have to worry about condensation with a cotton canvas tent. Once the weathering process is complete, the only downside to canvas is the weight. If you don't have to hike with it on your back, a cotton canvas tent is the better tent choice. When you buy a tent, all the pieces you need to pitch that tent should be right in the bag. The only exception and a nice thing to have when pitching a tent is a stake hammer. Sometimes the ground is too hard to push the pegs in by hand and anchor the tent to the ground. When that happens, a stake hammer comes in handy for some encouragement. As mentioned, most of the equipment you'll need in pitching a tent comes with the tent. When pitching a tent you'll need some or all of the following, depending on your tent type. The reason you need a good tent is simple. Tents protect you from the elements. A good tent is important because it keeps you dry in the rain and out of the sun mid-day. A good tent will also keep the pesky mosquitos and flies away from you and provides a cozy place to sleep. Whether you're camping on a mountainside, deep in the woods or on the beach, a good tent can make or break your trip. A good quality tent designed explicitly for your vacation does you absolutely no good if it's not correctly set up. Pitching a tent is relatively simple with instructions straight from the manufacturer. A properly pitched tent shields you from the rain and doesn't blow away with a gust of wind. Also, when your tent is secure, you and your family are too. Peace of mind in your family's security during your trip is the most significant benefit to a well-pitched tent. The easy answer to pitching a tent is to follow the instructions. While that is true and the best way to set up your tent, that's not the whole story. To properly pitch a tent, you're going to do a little prep work. If you do the prep right, the work can result in a perfectly pitched tent, no matter which tent you choose. Before you pack up your tent and your family and head out to the woods, it's a good idea to practice pitching your tent. Go into your backyard and take everything out of your tent bag. Pick a nice level area and make sure you have everything in your tent bag, including the instructions. Following the instructions, set up your tent. Pitching your tent at home will give you practice and make your job easier when you get to your destination. When you reach your camping destination, the first thing you want to do is scan the area for the best place to set up camp. The ideal location is an already established campsite. If there aren't any campsites already in the area, find a place in a high lying area at least 200 feet away from water. Keep an eye out for trees or a hill that naturally breaks the wind before reaching your site. Also, pick a flat area with surrounding trees for protection. You can also use these trees to attach your guylines, if necessary. When you're in the perfect spot, get started. 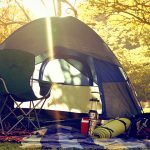 The first thing to do is to clear the area of any rocks or debris that might injure your tent or bother you while sleeping. Next, lay down your footprint. A footprint is a sheet of rainproof material (like a tarp) that provides a barrier between your tent and the ground. Make sure your footprint is a little smaller than the floor of your tent, so it doesn't collect rainwater or extra condensation. Next, get your instructions out and assemble your poles. Once you put your poles together, lay out your tent over your footprint and stake it down. Using your instructions as your guide, insert the tent poles in the corresponding tent opening. Once you insert the poles, it's time to bend the poles and raise your tent. The poles are either going to attach to create a structure or fit in pins located at the base of your tent. Your instructions will tell you where to attach your poles, so be sure to have those handy. Since you took a practice run at home, you'll know the right way to raise your tent with the pole structure. If you are in a high wind area, you'll need to attach the guylines. Guylines are ropes that attach to the loops on the sides of your tent where the poles are. Attach the other end of the guylines to surrounding trees to prevent your tent from flying away in a gust. Once you raise your tent, the only thing left is camping and a good night's sleep. You picked the perfect spot, you've set your tent, and your sleeping bags are in position. Congratulations, you're ready to rest. As long as you've followed the instructions and chosen the right tent for your environment, you can sleep easy. For now, stoke the campfire, load up the marshmallows and gather your family around for a night of stories. It's time to relax and have fun. You've earned it.